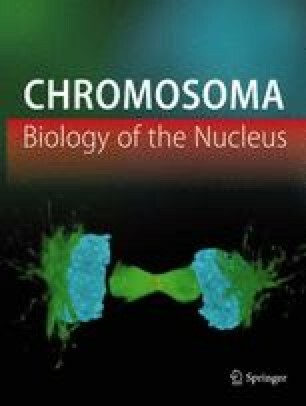 The DNA content of micronuclei, macronuclear anlagen, and of macronuclei of three age categories (“young”, “mature” and “old”) has been studied by cytophotometry of Feulgen stained isolated nuclei. The DNA content of the macronuclear anlagen decreases, at average, to one half of that of the micronuclei, from which they develop. Accumulations of fibro-granular material have been revealed electron microscopically at the periphery of such anlagen (in the thin perinuclear layer of cytoplasm); this material seems to have a nuclear origin. The DNA content of young macronuclei remains as low as that of the anlagen, but in mature ones it again increases approximately to the level of the micronuclei. The DNA content of old macronuclei is highly variable and ranges from equal to that of a micronucleus to exceeding this level about six times. These data indicate that a part of the genome of the micronuclei is lost at the beginning of their transformation into macronuclei, and that there is subsequent partial replication of some DNA fractions in maturing and ageing macronuclei.